In Days Gone By: When The Stage Really Was A Stage! It took some time to decide on an image of the stage as the majority of us will fondly remember it. In the end, I chose this wonderfully evocative shot of House Performing Arts from December 2008. 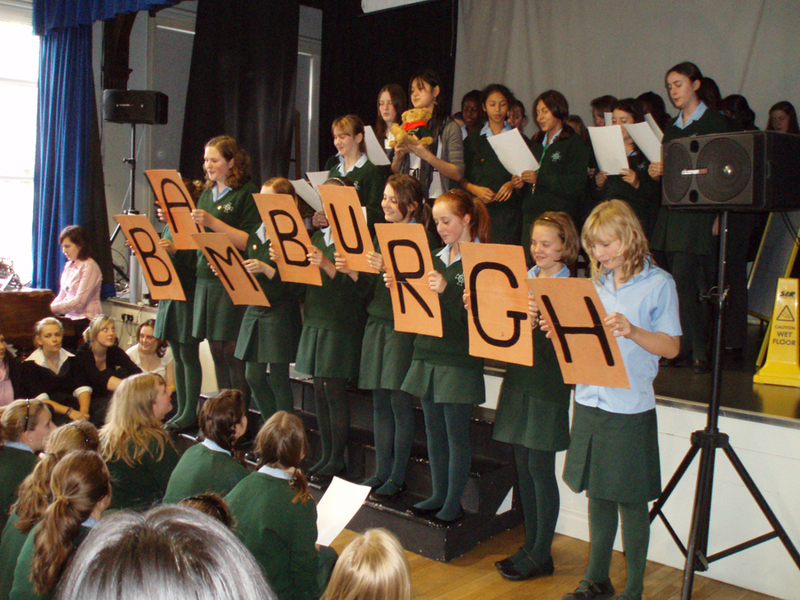 In keeping with our tagline ‘A Voice for Every Girl’, the stage can here be seen jam-packed full with happy, confident-looking girls – the Bamburgh House musicians to be precise – all totally at ease with their special celebratory moment performing in front of the rest of the School. The dictionary definition of a stage is ‘a raised floor or platform on which actors, entertainers or speakers perform’ and indeed a ‘platform’ is how it was described on WH Wood’s architect’s plans. 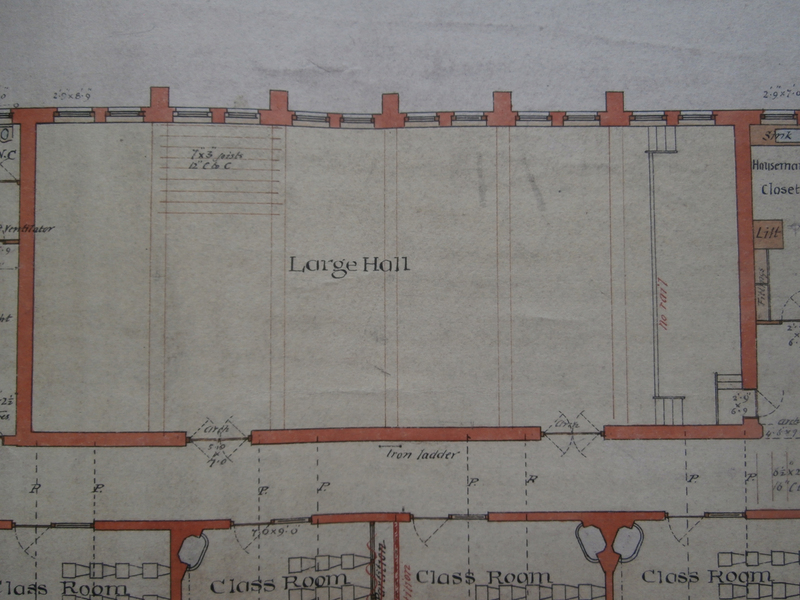 The stage end of the Assembly Hall as it appears on WH Wood’s architect’s plans, pre-1925 (above) and on Oliver & Leeson’s original 1888 plans (below): Tyne & Wear Archives. 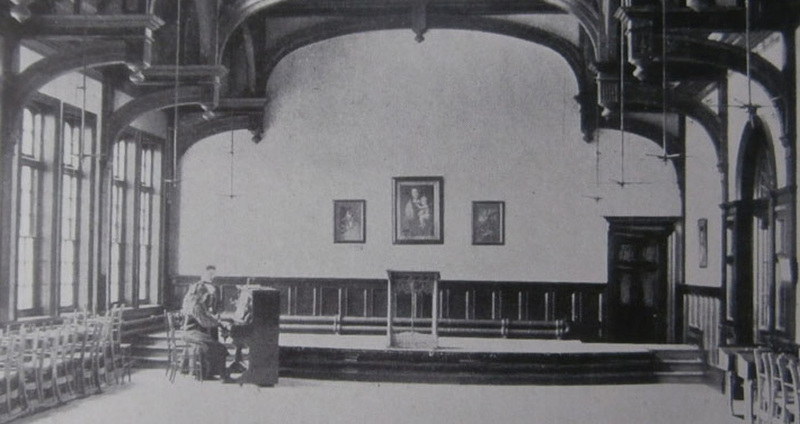 The very first Newcastle High School prospectus held by Tyne & Wear Archives contains a photograph of the Hall which must closely represent how the platform would have appeared on this occasion. The first image of the Newcastle High School stage c1900s. 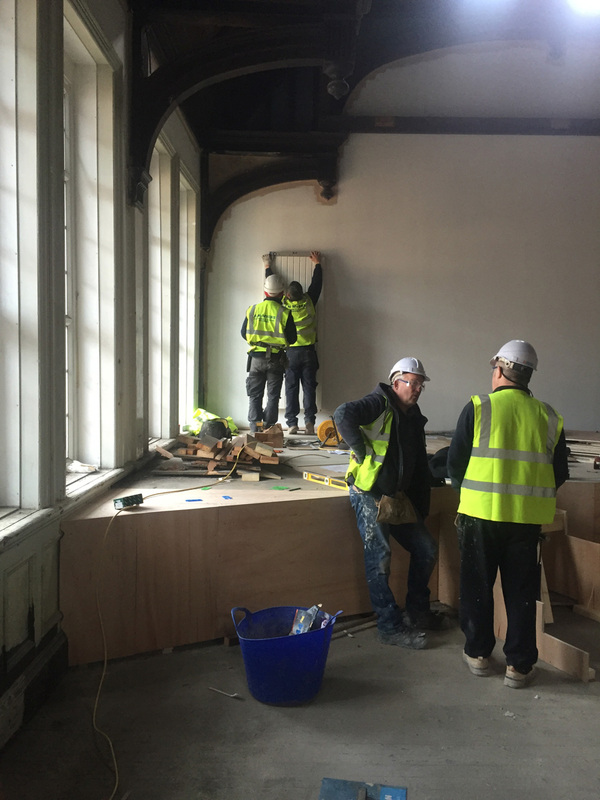 Note the Church High reading desk is already in situ by then. 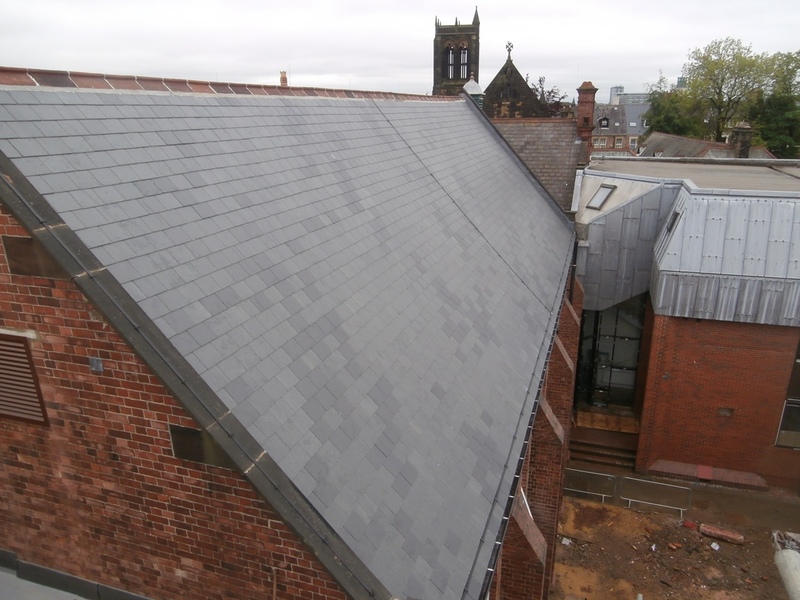 As a truly independent Independent School, Church High had to raise its own finance should site developments be required. So it was in the early days of Newcastle High School too. The Jubilee Book tells us that by 1897 ‘the school had already begun its policy of trying by its own efforts to raise money both for itself and others.’ At that time, thanks to performing tableaux vivants and a sale of work, £22 was raised, £15 of which was spent on pictures: ‘seven for the Hall and one for each form room’. 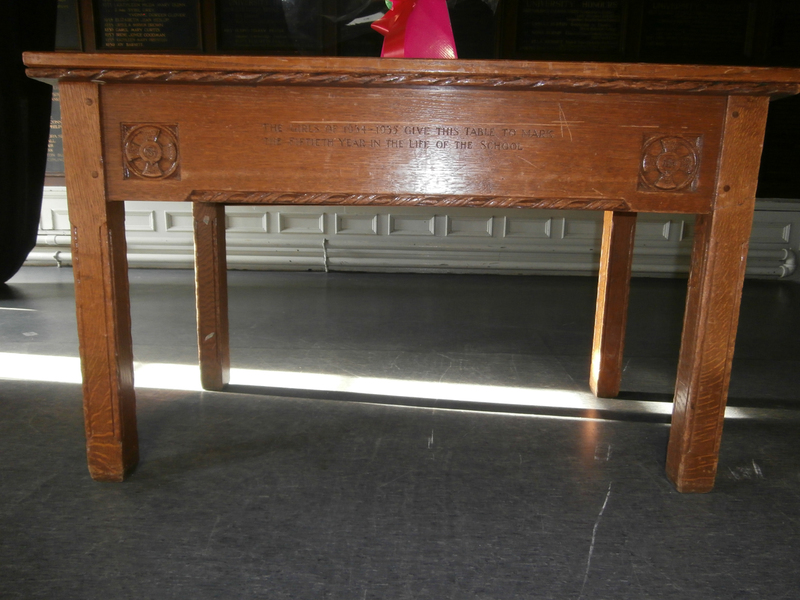 Some of these pictures can clearly be seen in the image above as can the beautifully-carved ‘reading desk’, so familiar to anyone who knew Church High, which was bought ‘a year or so later’ with £9 raised via more tableaux vivants. 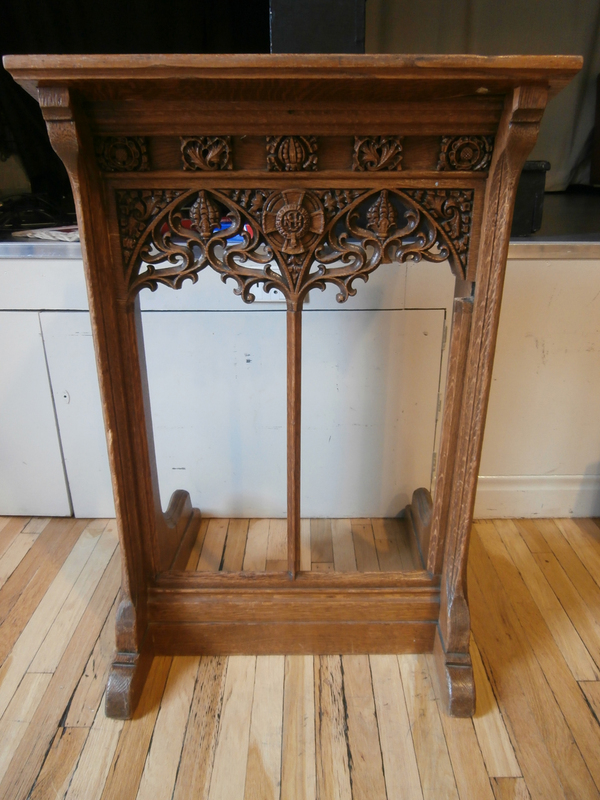 The intricately-carved Newcastle High School reading desk was the first piece of stage furniture purchased at a cost of £9 c1899. 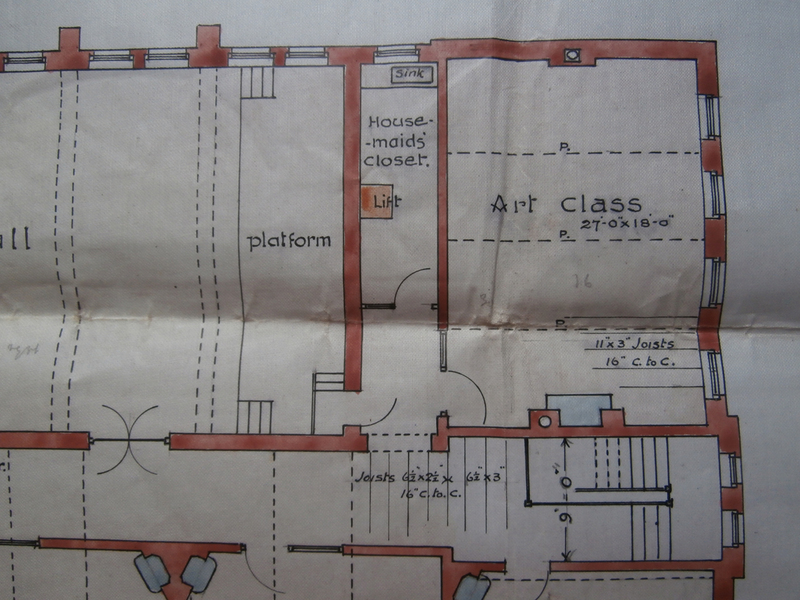 The third prospectus in the Archives, produced sometime before 1918, shows the platform stage (a little higher by now, you may notice) with 1911 Old Girls Honours boards in situ. Again thanks to the Jubilee Book, we know that later on ‘a fund was started for buying a grand piano’ and that this fund also ‘received substantial help from the Old Girls who had already formed a dramatic club and were beginning to give something back to the school.’ On the evidence of photographs of the Hall in School prospectuses, the grand piano seems to have been successfully purchased by 1927/28. 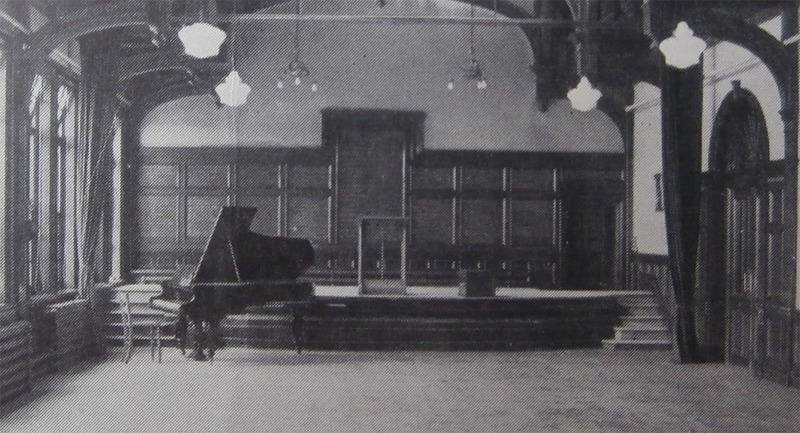 By 1927/8, the platform is still semi-circular in shape but the upright piano has now been upgraded to a grand piano. 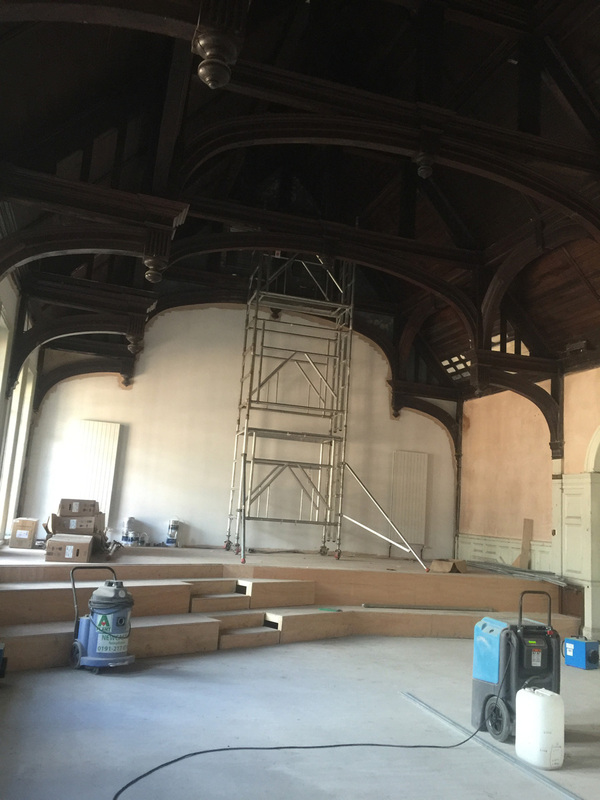 Right up to Heritage Open Day in 2014, however, the Church High stage was synonymous with three pieces of wooden stage furniture. 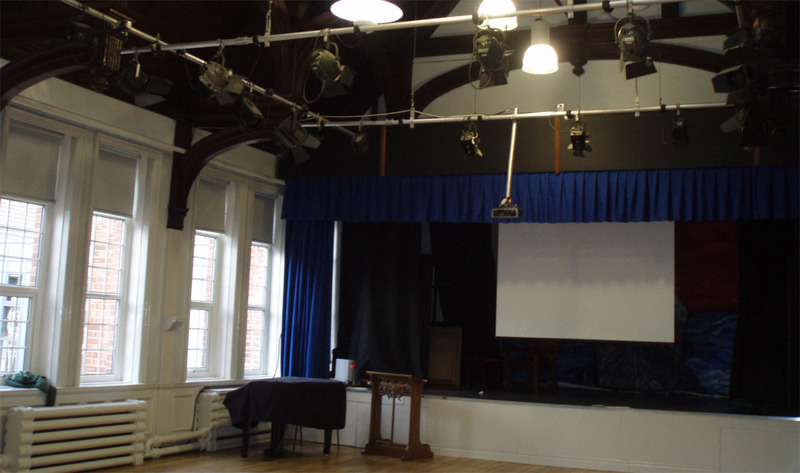 The Church High School stage on Heritage Open Day, 2014. 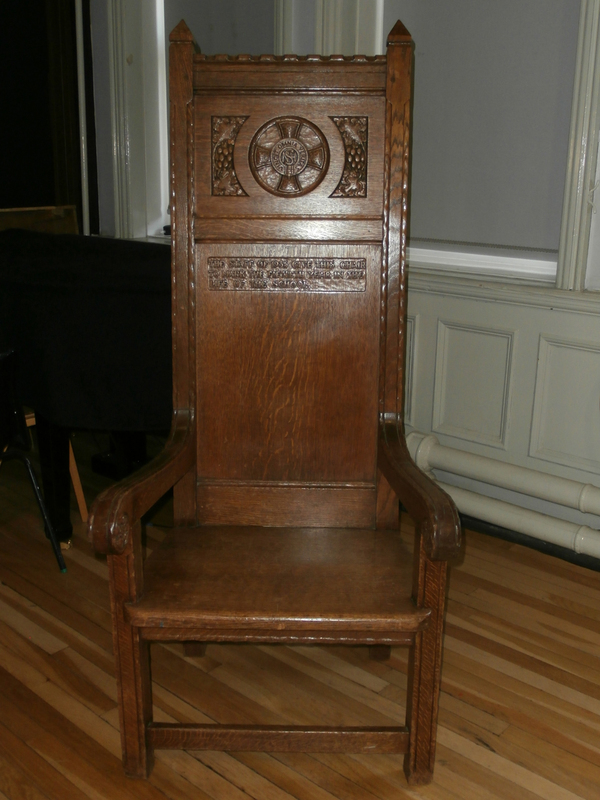 The Church High Jubilee Chair of 1935. 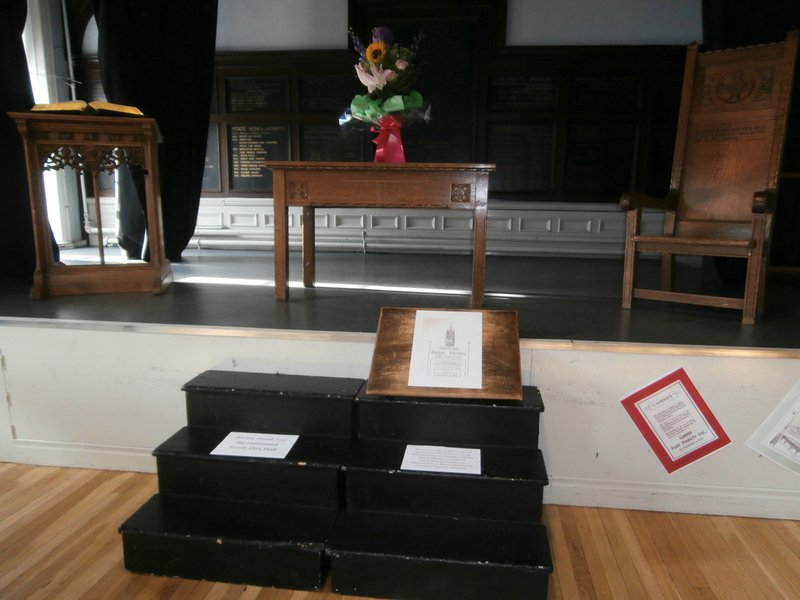 The Jubilee Table presented to School by the girls in 1935. 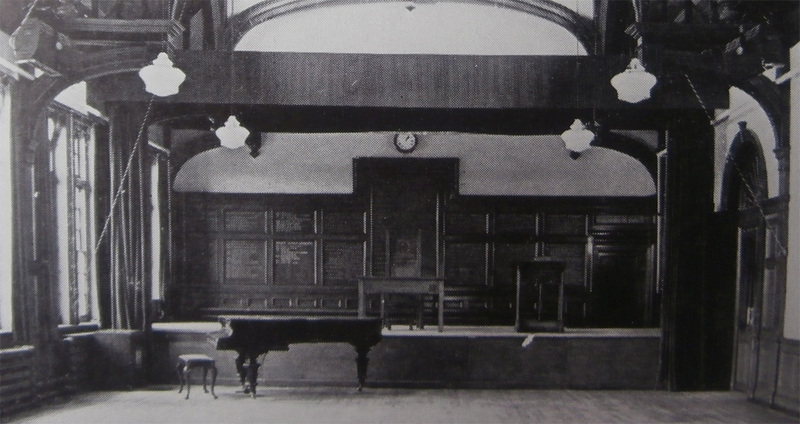 A later school prospectus (post 1935) shows the platform as most people will remember it: with Jubilee Table and Chair in the centre and with a wooden pelmet over-head to allow the introduction of stage curtains, which in this image look very dark. A wall clock (presumably for school examinations) has also been introduced and the observant will have noticed the stage has now also been boxed in. 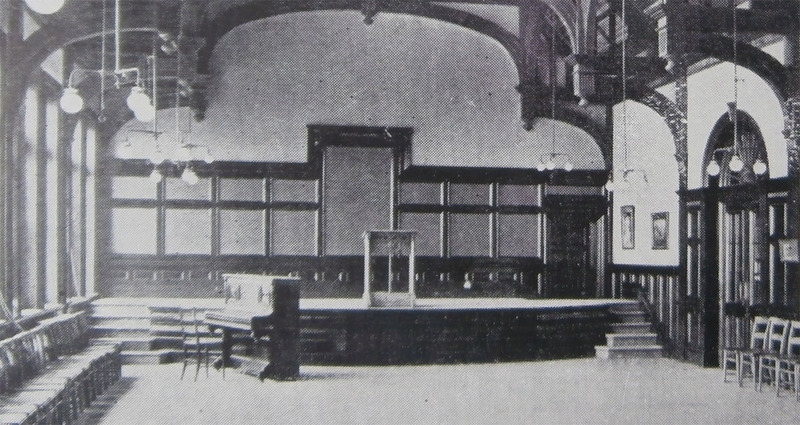 The Church High stage post 1935 with Honours boards behind, Jubilee Table and Chair in the centre, lectern to one side and wooden pelmet over-head to hold the stage curtains. I joined Church High in the Autumn Term of 1985, consequently just missing the Centenary Staff photograph taken in front of the stage. 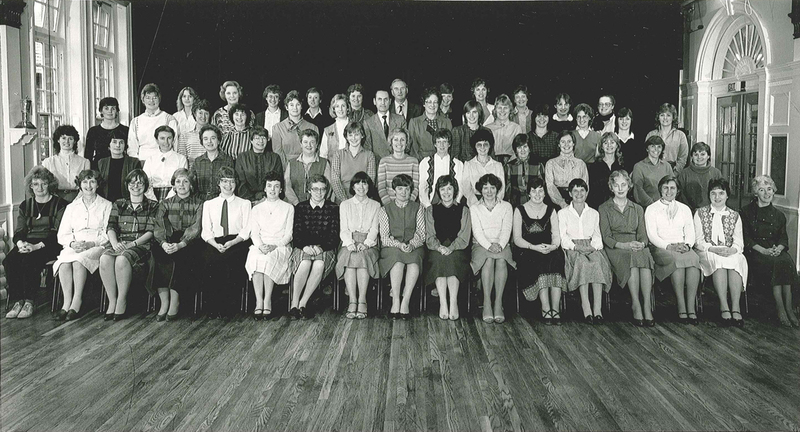 The Church High Centenary staff of 1985 seated in the Hall in front of the stage. Miss PE Davies (centre) was the Head. The first school production I remember was ‘The Mikado’, but the first I photographed for the Senior School Magazine was ‘The Taming of the Shrew’, a lively production directed by Jill Mortiboys, Head of English. At that time, the stage curtains were a deep yellow gold velvet with a light grey velvet back-curtain for production use. The final curtain call for ‘The Taming of the Shrew’ in 1987. 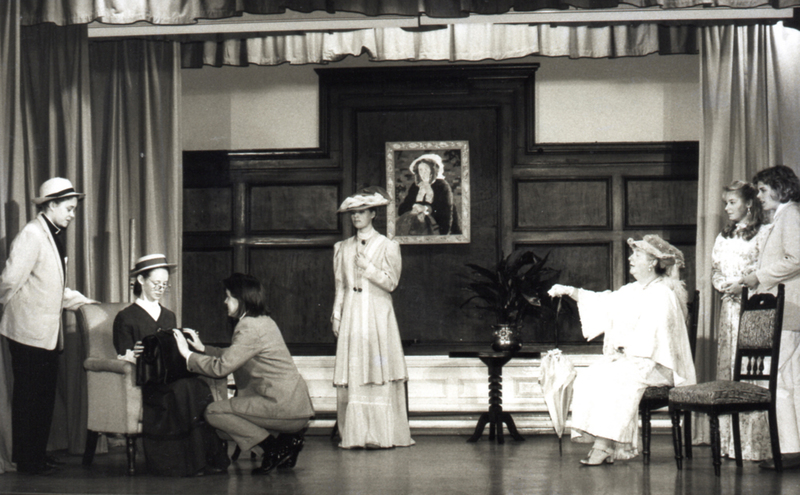 One of Jill’s finest productions, in my opinion, was ‘The Importance of Being Earnest’ in 1988. 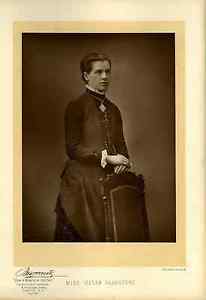 The design suited the Church High stage so well and amongst a very strong cast – including Mrs Cox as Lady Bracknell – was Lucy Webster (Gwendolen) who went on to have a very successful acting career under the name of Lucy Akhurst. Church High’s most successful professional actress, however, is Andrea Riseborough who has received acclaim on stage, TV and also the big screen. She graced our stage many times as girl, of course. 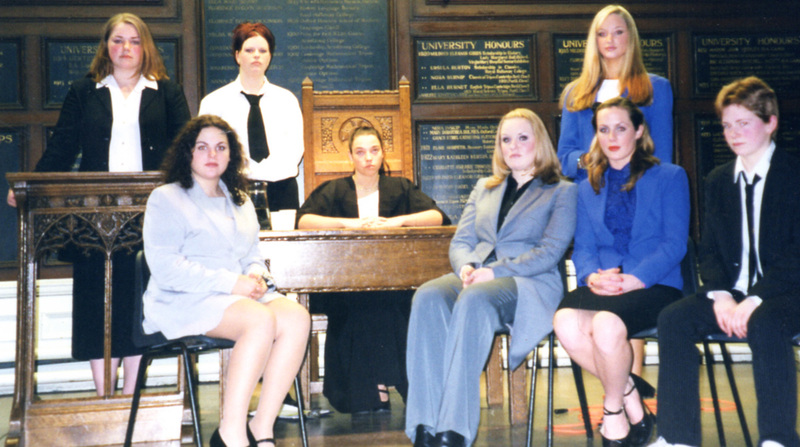 Andrea Riseborough (back row, far right): A Level Theatre Studies production ‘The Trial of Louise Woodward’, 2000. In recent times, the stage curtains were royal blue velvet and with the advancement of technology it also gained a projection screen. The stage in recent times: black stage-flats, a full lighting rig, an overhead projector and screen for assemblies and the lectern now moved down to the floor to support laptops. 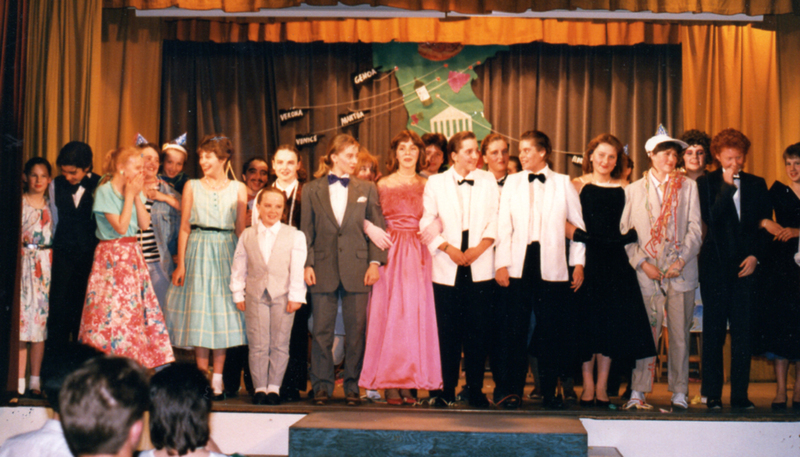 Just as Newcastle High School prize giving moved from the Hall to a larger venue, so the Church High school production – in latter years large-scale musicals – transferred to The Little Theatre in Gateshead and later The Peter Sarah Theatre, Newcastle College. However, House Performing Arts festivals continued to use the stage and who could forget those riotous Staff Pantomimes too? Traditional end to the Christmas Term: the Staff Pantomime. 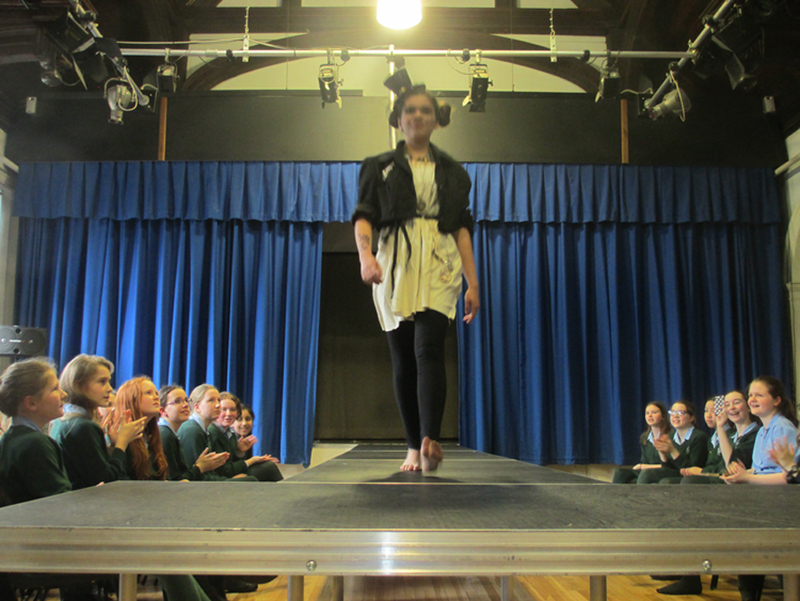 With the introduction of A Level Textiles to the Creative Arts curriculum, the stage was extended via a catwalk for fashion shows. Jessica Kinnersley, Head of Textiles, surveys the Hall fully set up for the A Level end of course Fashion Show (above) while Church High girls enjoy a dress rehearsal run through (below). Whenever I look at the modern platform at the north end of the old Hall, I for one still see all the dark natural wood and the shiny gilt of the Honours boards in my mind’s eye. 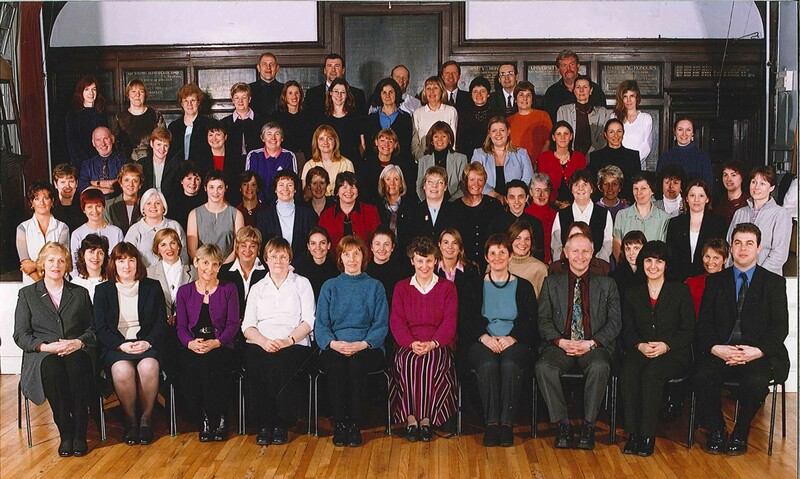 For me, it will always remain peopled by those who gave so much of themselves to the life of Church High, as it was for the 2000 Millennium Staff photograph. The 2000 Millennium Church High Staff fill the stage and the floor before it. A tremendous group of people to work alongside. I stand second from the left on the second back row. Even as all of the stage furniture accumulated over the life of the School was being dismantled in the summer of 2014, for me, the Church High stage still managed to retain its dignified presence. The dismantling of the old stage begins, summer of 2014. 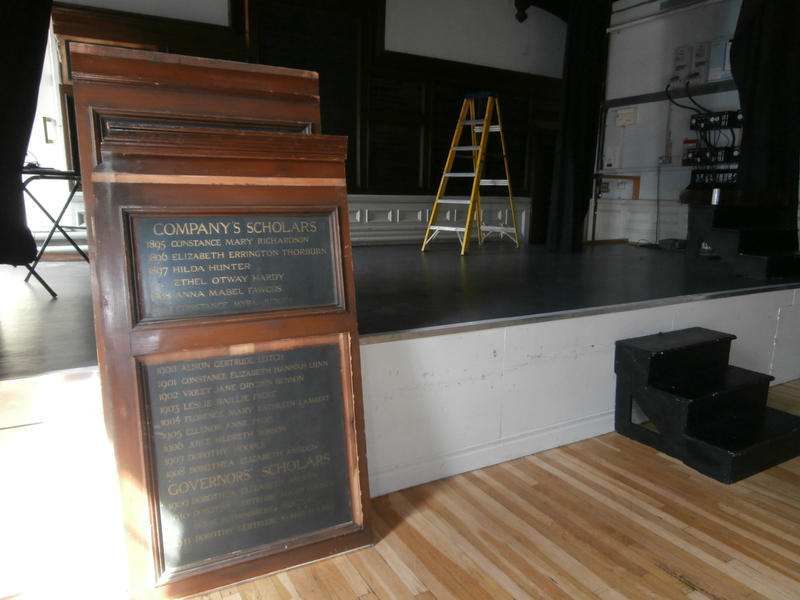 ‘All the world’s a stage,’ said Jacques in ‘As You Like It.’ However, at NHSG, the old stage is a stage no more. It is now merely a raised platform area in the Sixth Form Common Room. 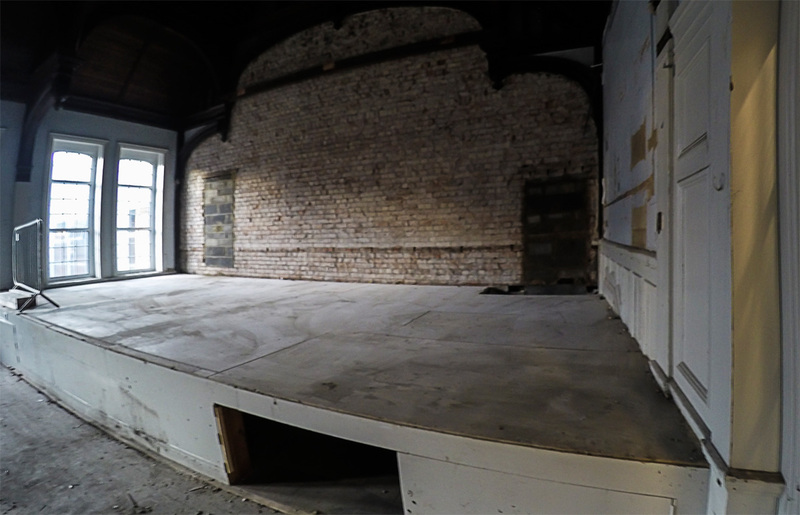 In the above image, taken in October 2015 after the north end Honours Boards were removed by Wates, the Church High stage layout is still recognisable from the two bricked up doorways, stage left and right. Yet only one of these, the one to the right, is original. You can still see the stairwell in front of it – site of more than one dramatic calamity over the years. I’d never really considered why it was like that until I talked to Paul Brown, one of the joiners, recently. He mentioned in passing something I should have realised from old photos. There’s actually an earlier – semi-circular – low-level stage underneath. Paul Brown at work extending the staging, March 30th 2016. 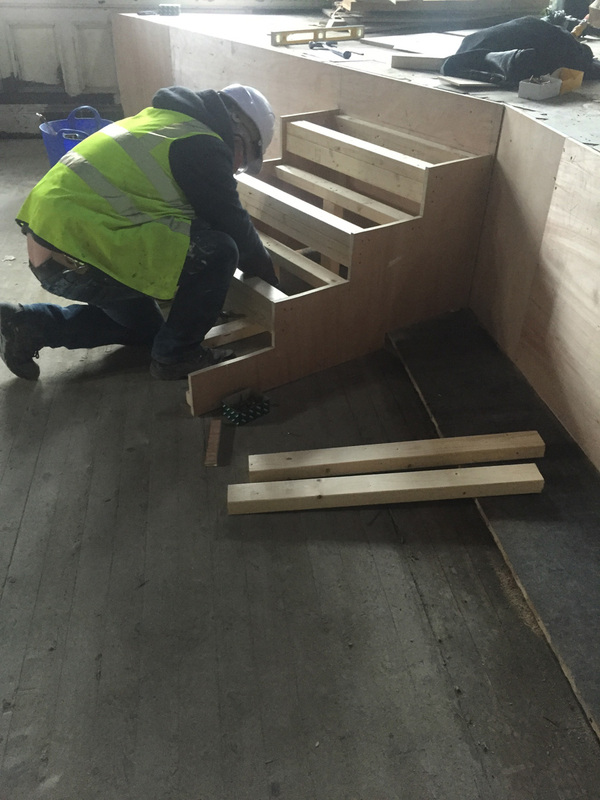 As Paul did the initial joinery work needed to extend the stage, it was he who removed the ply-board at the front. When we talked back on Tankerville Terrace, he said he wished he’d mentioned it to me at the time so I could have taken photographs. However, if you look closely at the images above and below, I actually captured the first stage in March without realising it. God is kind. In flashlight, the lower stage is clearly visible. Giuseppe told me that the new, shaped extension to the old staging is his favourite modern architectural element of the renovated Tankerville building. 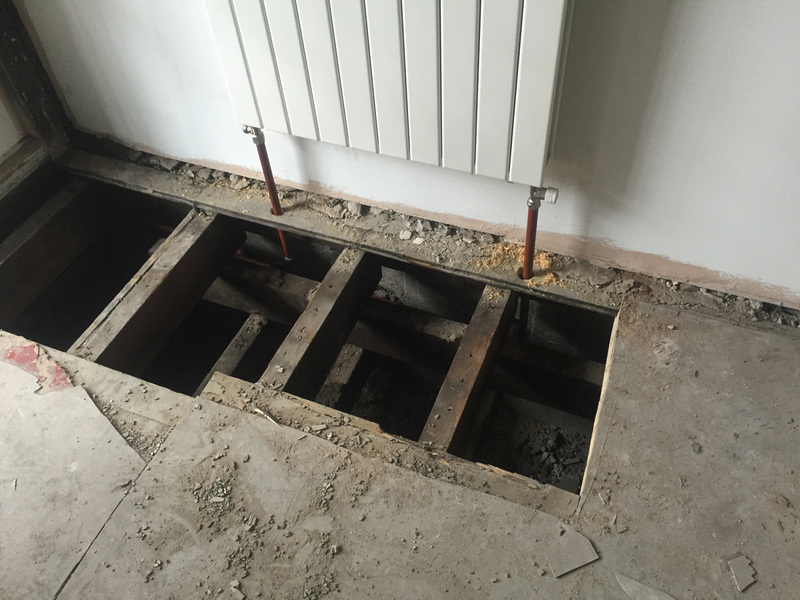 The company who provided this specialist joinery service in April were Aspen Joinery. Neil and his brother, Dave, also re-modelled the steps in the eaves Marketing Office too. New steps in the last office created in the south gable eaves. 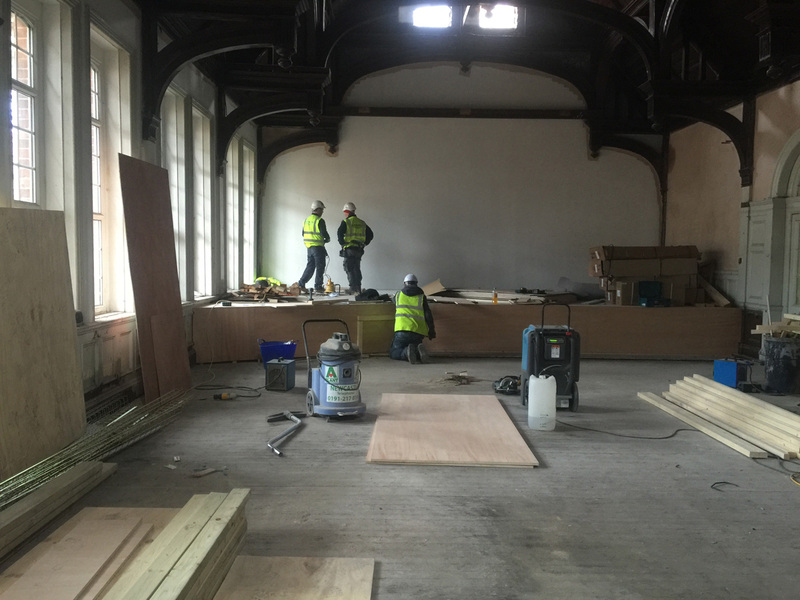 Although the specialist joinery work was carried out in April when I was still allowed access to the building, on my visits I only saw the very start and the end of this process for myself. However, as Giuseppe was on site inspecting work on the 7th, 8th and 11th April, the photos he took document the transformation of the stage more effectively – and more dramatically – than I could ever have done. 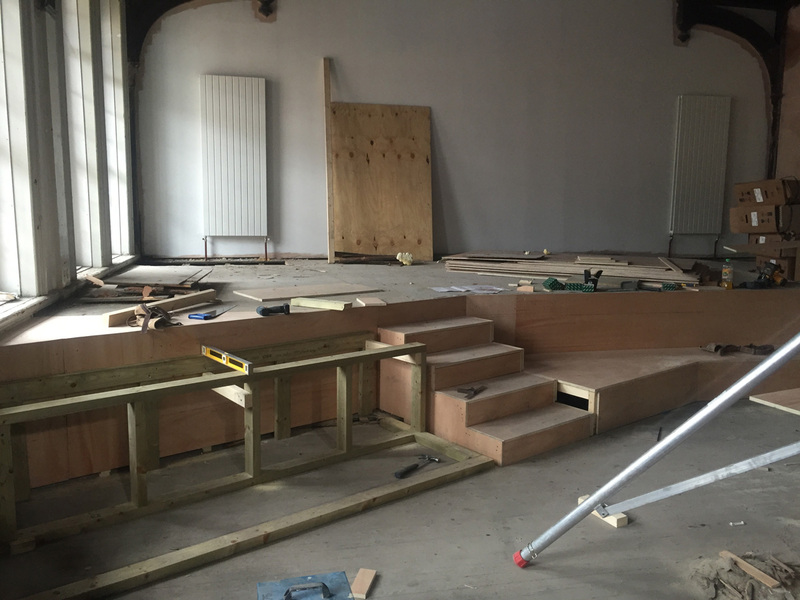 April 7th: the curved stage extension is all in place by now and the access stairs are just about to be added. The two men on stage are surveying the site of the old door, stage right. 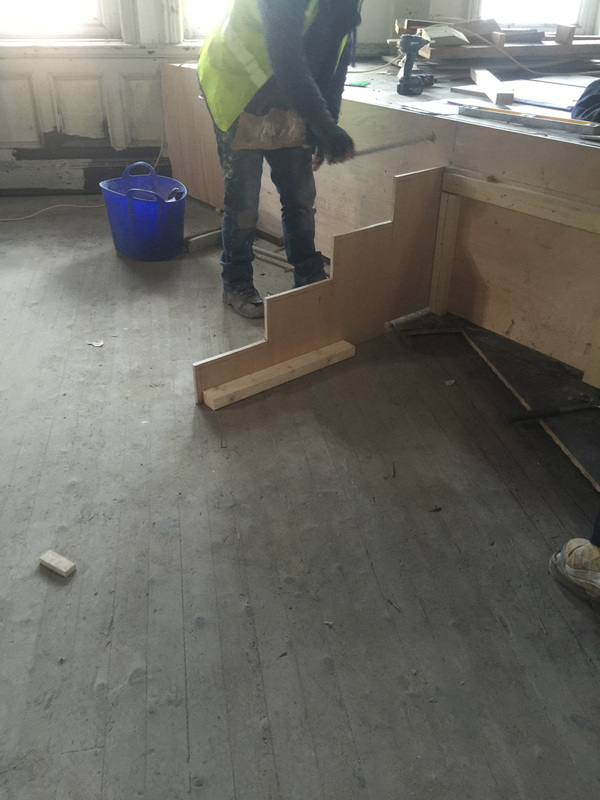 A joiner beginning to create the set of steps. 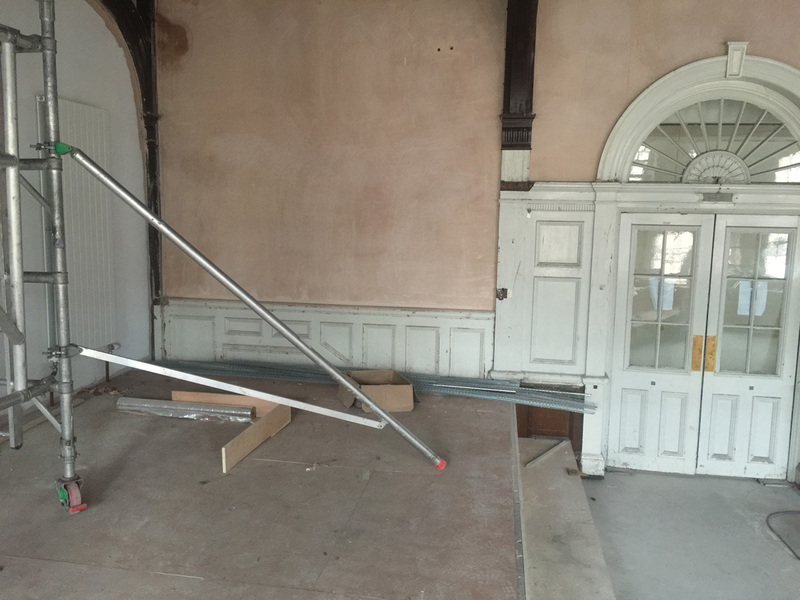 The position of the old doorway stage-right is soon to be marked by a vertical radiator. 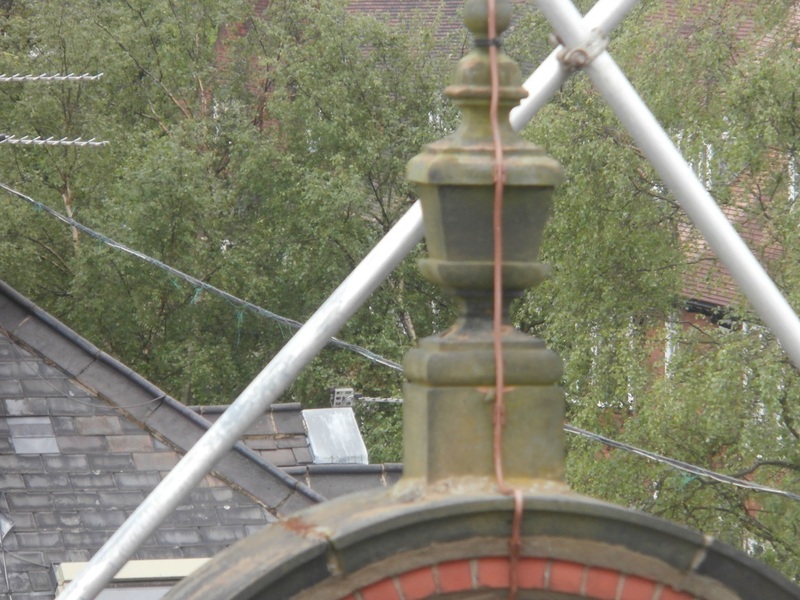 At the base of the newly installed vertical radiator, the original semi-circular Newcastle High platform can still be seen. 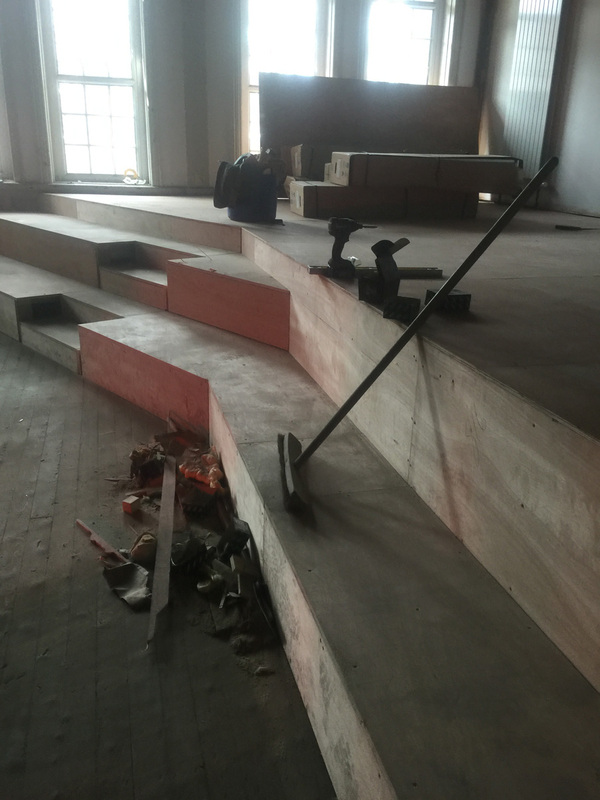 By the time the slats of the steps are being installed, a vertical radiator marks the site of both Church High stage entrances. When I first joined Church High, the door stage-left was the way Miss Davies always entered the Hall for whole school assembly each morning. 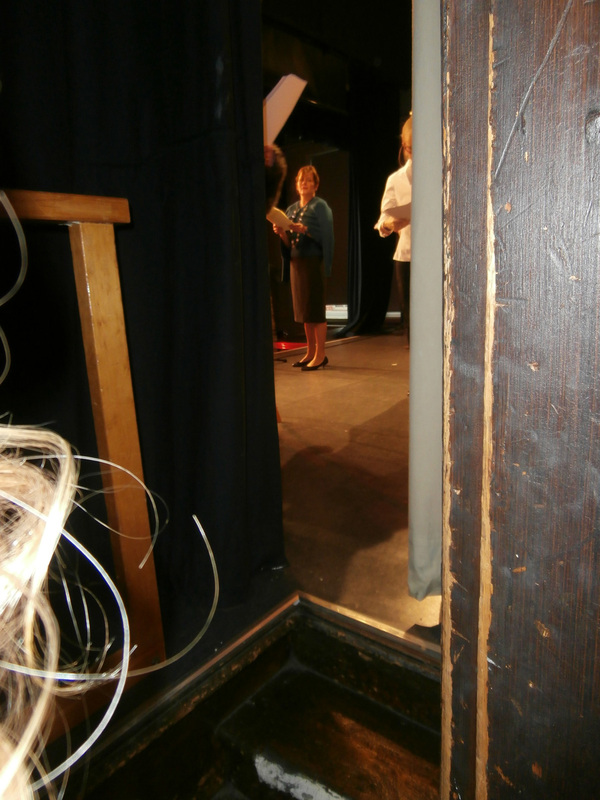 The heavy clunk of the door closing and the sound of her foot-fall in the back stairwell which lead up to the stage was the School’s cue to fall silent before the hymn number was announced. Both entrance doors were used during school plays, of course. 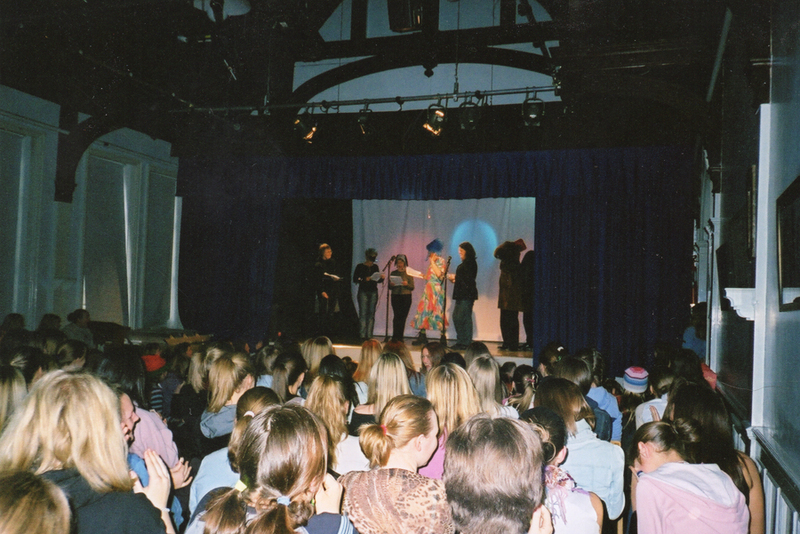 However, as large-scale musicals became prevalent in recent years necessitating a bigger stage area, the final time the Church High stage was used for a dramatic performance was the 2013 Staff Panto. 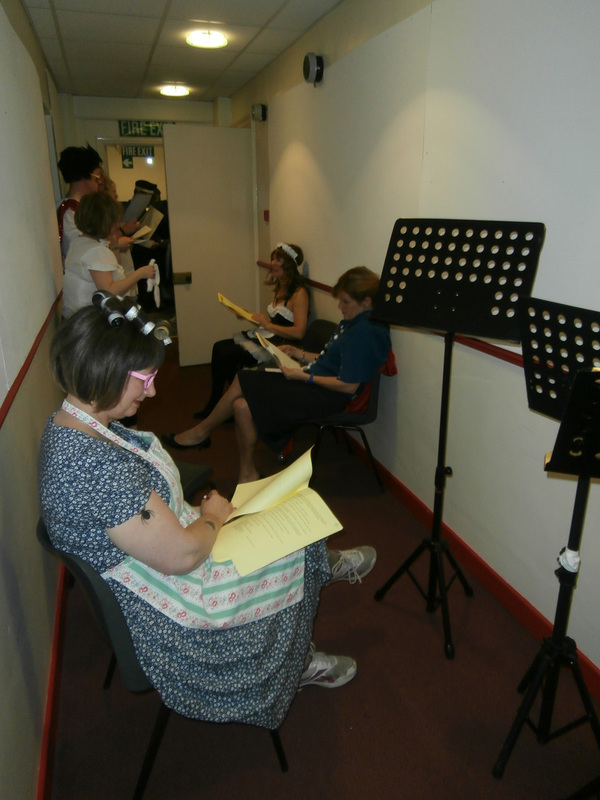 If you never got to enjoy the backstage area mid-show, the following photos I took during that last pantomime give you some idea. 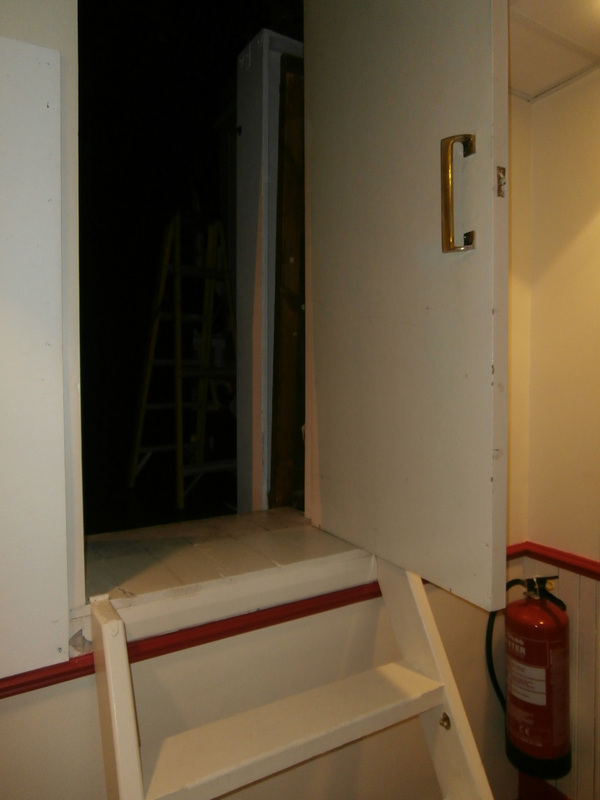 Backstage corridor during the Staff Panto, Dec 2013 with the original door stage-left open. The stage from the back entrance stage-left. The guard-rail was added by Gentian after Mrs Thew took a tumble down the stairs in search of the light-switch early one morning. The second door stage-right (a later addition, discretely created within the stage panel-work) was only opened up for performances. 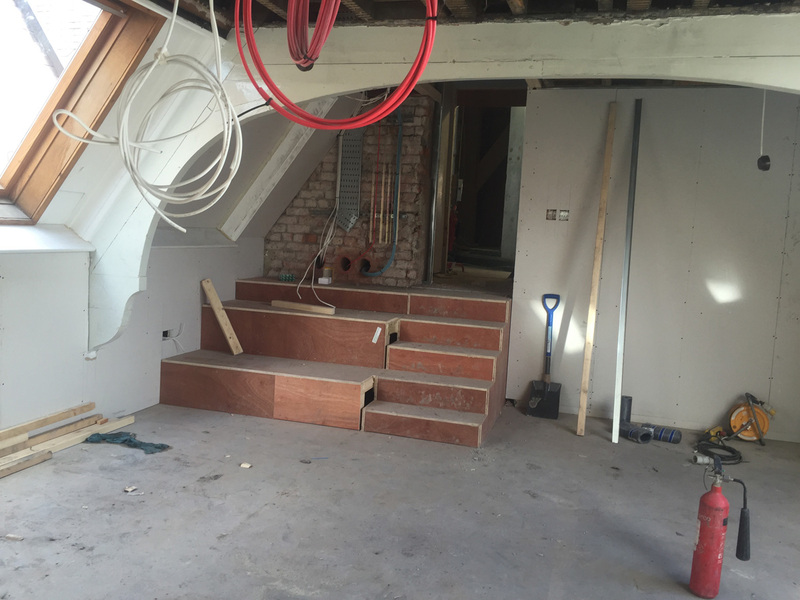 Aspen Joinery completed installing the bespoke stairs on April 7th. 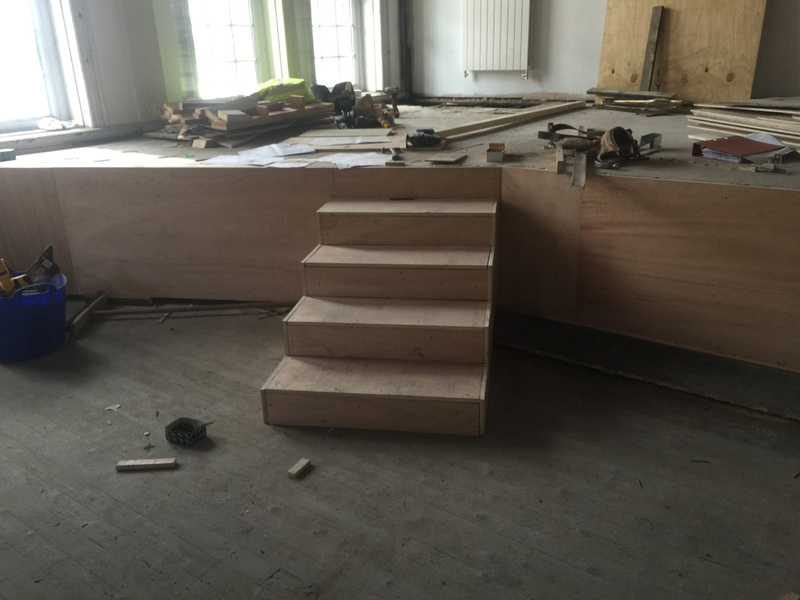 The new bespoke platform steps take shape. The next stage of Aspen’s work was to add a further level of tiering to the newly-extended platform creating a high standard finish. A lower level is added to the tiering stage-right (above). The end product was a well-crafted, high standard finish (below). I was fascinated to see in one of Giuseppe’s photos that creating this lower tier stage-right revealed a small section of unpainted dark wood panelling. 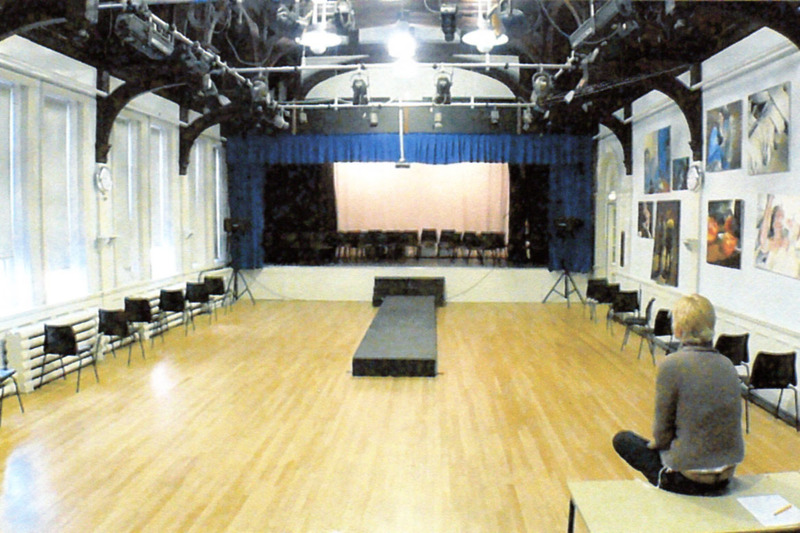 This is how the Hall would have looked originally. 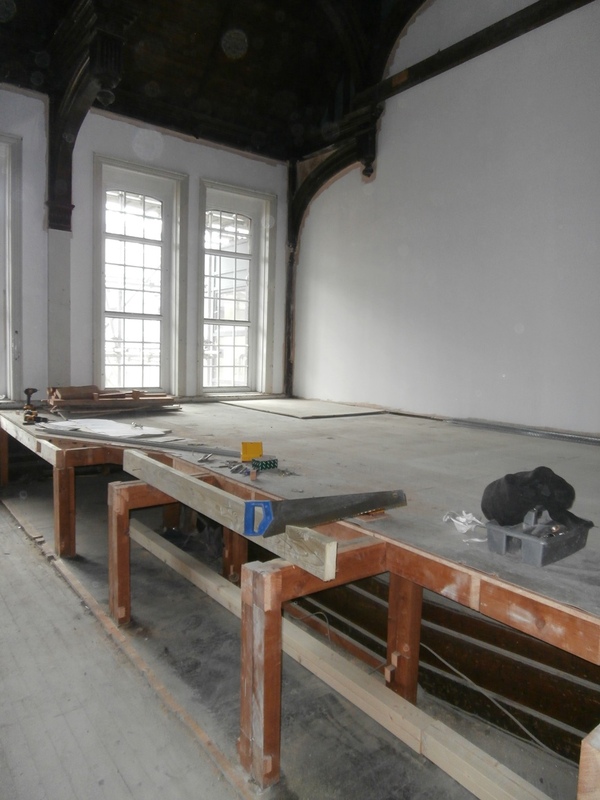 Towards the right, a small section of unpainted panelling reveals how the Newcastle High School Hall originally looked. In my next post I intend to take you on a trip down memory lane as far as the School Hall is concerned, but, for now, I will leave you with two final images. 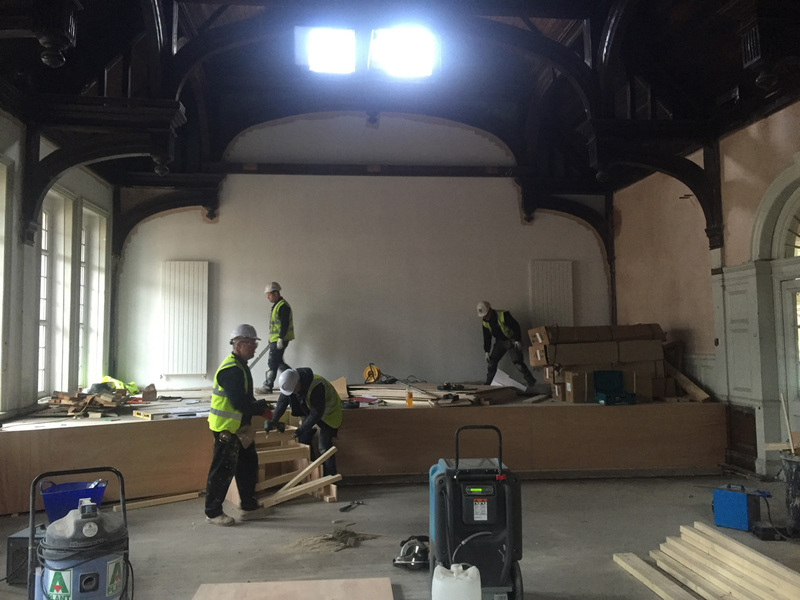 Firstly, how the ‘Mark 3’ stage looked when Aspen had completed their work on April 26th followed by the finished product: the raised seating area of the NHSG Sixth Form Common Room as it appeared on Church High Alumnae Open Day. 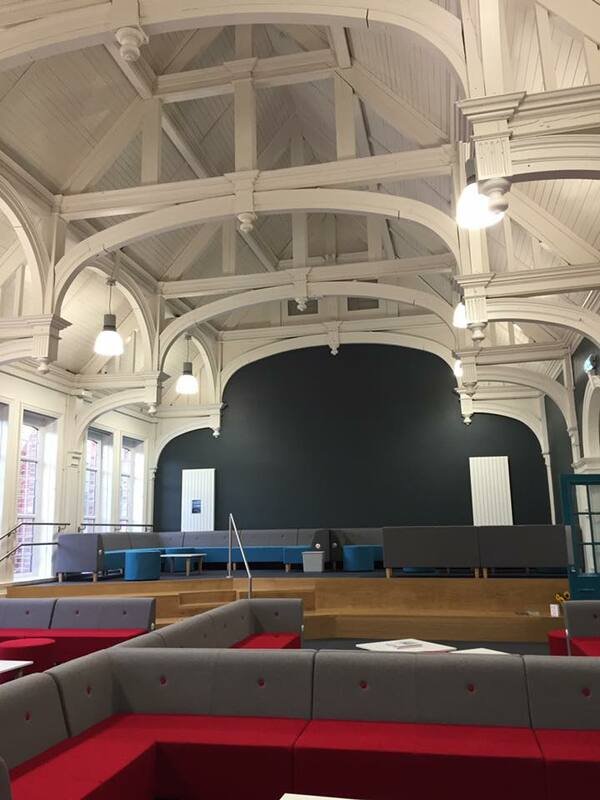 The north, stage end of the Church High Hall is now transformed into a raised seating area for the NHSG Sixth Form Common Room. 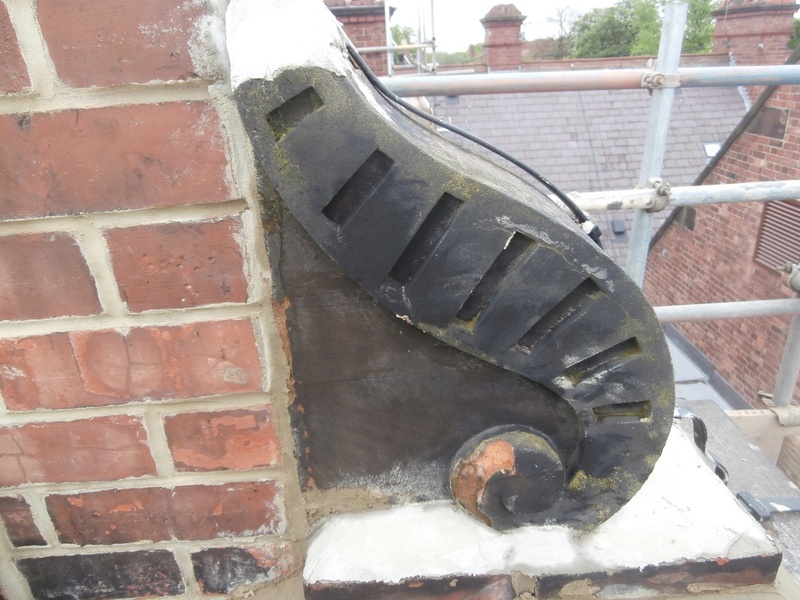 Going back to 5.00pm on Thursday 26th May, you may remember I sat on a low wall outside the Old Building while an ‘under-cover’ agent went in with my camera to photograph the Hall beams for me. Well, I was actually left sitting there for quite a long time. Longer than I’d expected to be. And, however much I love the red-brick Victorian architecture, the basement of the 1935 north extension offers little to occupy one’s mind for long. Even a mind like mine. My eye-level view from the wall of the 1935 north extension basement at dusk that day. In his commentary written for the Old Ordnance Survey Map of Jesmond for 1913 , Alan Godfrey provides the following description of the school building and, in particular, its architectural style: ‘Jesmond’s first purpose-built school, the High School for Girls, was opened in 1890 in Tankerville Terrace, a development of a school set up in Jesmond Road by the Church Schools Co. in 1885. It was designed by the Newcastle architects Oliver & Leeson, the ornate cupola and Flemish gables giving it some of the bravado of the Moor Edge institutions.’ The ‘ornate cupola’ refers to the original bell-tower, of course, but, until I read this description, I had never really thought about the distinctive design of the gables. To me, it was just what ‘Church High’ looked like. The ornate architectural features at the top of each gable. As the old saying goes, however, ‘Absence makes the heart grow fonder’. Thus, during the time we were forced out of the building, I found myself noticing many things about it I would not have given the time of day to had I still been working inside of it every day. 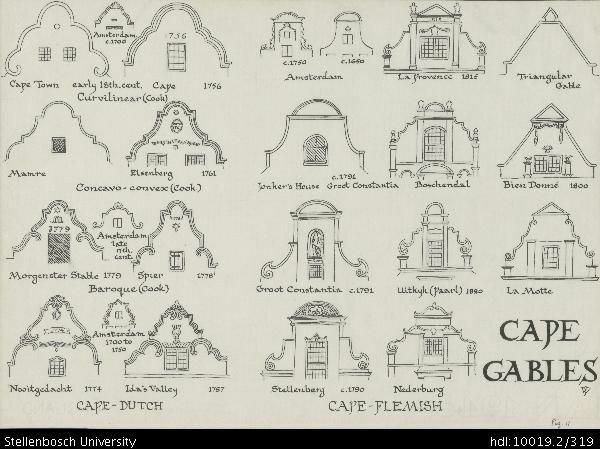 I cannot imagine myself googling ‘Flemish gables’ under any other circumstances. Nor being intrigued there were Dutch variants too. 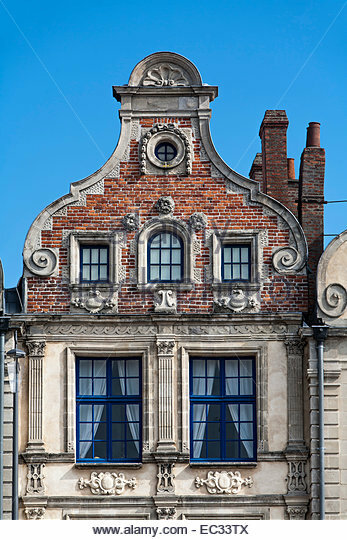 Google image search for Flemish gables. When I got home that night and checked the photos Paul had taken, the ‘extra’ shots he said he’d taken because I couldn’t have got them and because I’d said I liked architecture turned out to have been taken high up on the roof. No wonder I had spent so long sitting on that wall. As I’d already seen, thanks to some of Giuseppe’s photographs, it’s a different world up there and the views are simply amazing. 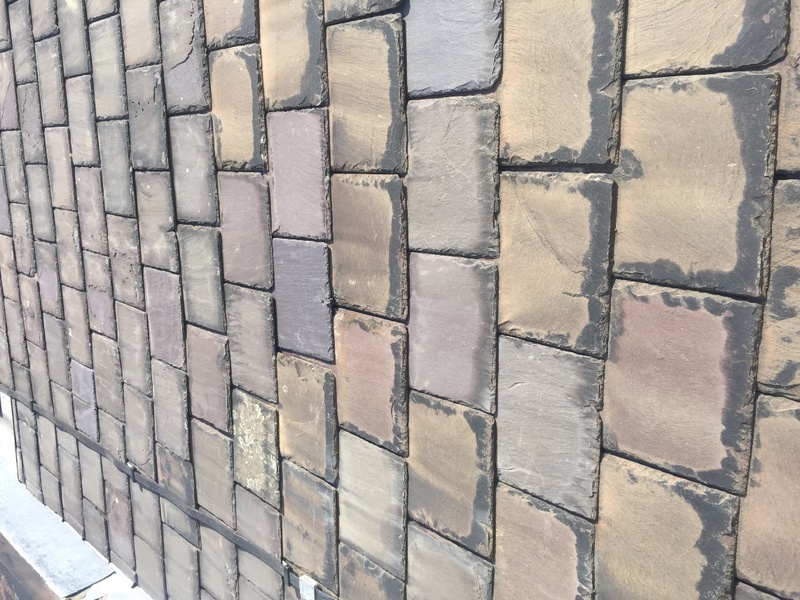 Giuseppe’s image (above) shows the wonderful variations of colour in some of the original slate tiles. 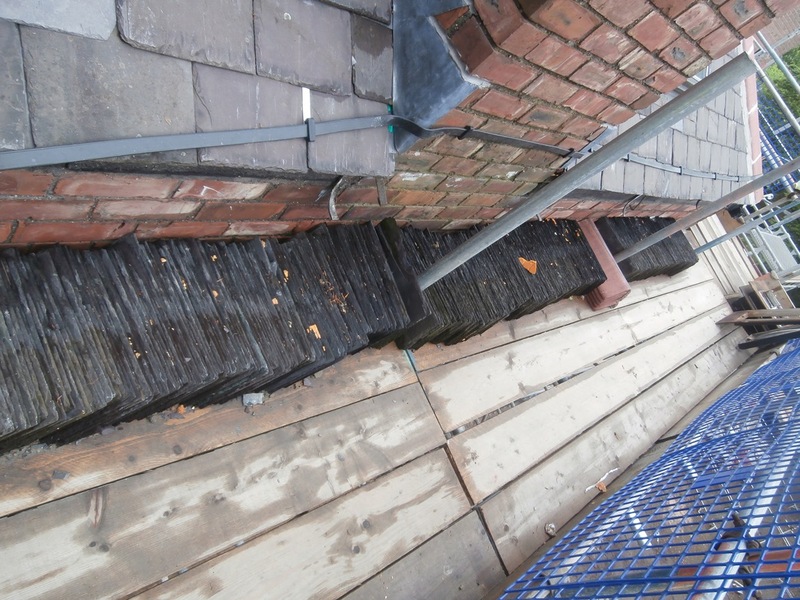 Paul’s shot (below) shows these original tiles are being removed and carefully stored before being replaced again onto the new batons. The roof scaffolding was largely around the north gable end at this point, so Paul’s photos are all from this area. My favourite shows the fabulous double roofline of the original High School building looking south towards the United Reformed Church. It includes the fascinating inverted triangular section of roof at the centre of the building which I had only previously seen via Google Earth online. I had always thought this to be the site of the bell-tower but have since learned it was an integral part of the Victorian ventilation system. The Main Building roofline from the north gable looking south towards the United Reformed Church and the Civic Centre. Paul took another interesting shot further to the right of this one which shows the full length of the re-tiled west elevation looking south towards the Science Block. 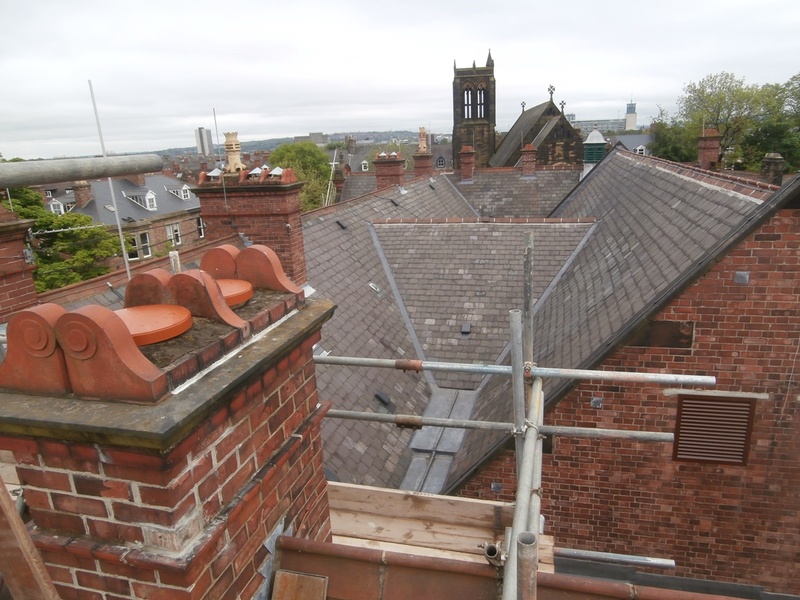 Old pictures of this section of roofline clearly showed sections of different coloured tiles where the original dormer windows were once situated. That’s not at all apparent now as the tiles have gone back on in different places. The Main Building west elevation and 1984 Science Block. 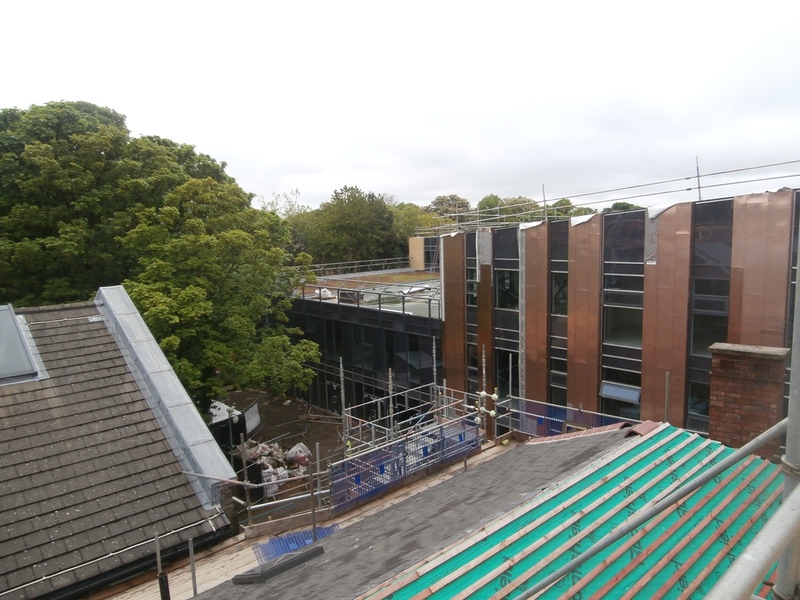 A shot taken much further to the left of the north gable end, possibly right at the very end, shows the Science Block from another angle. What I like about this picture is you can clearly see how the building expanded at the back – using the original playground area to do so. 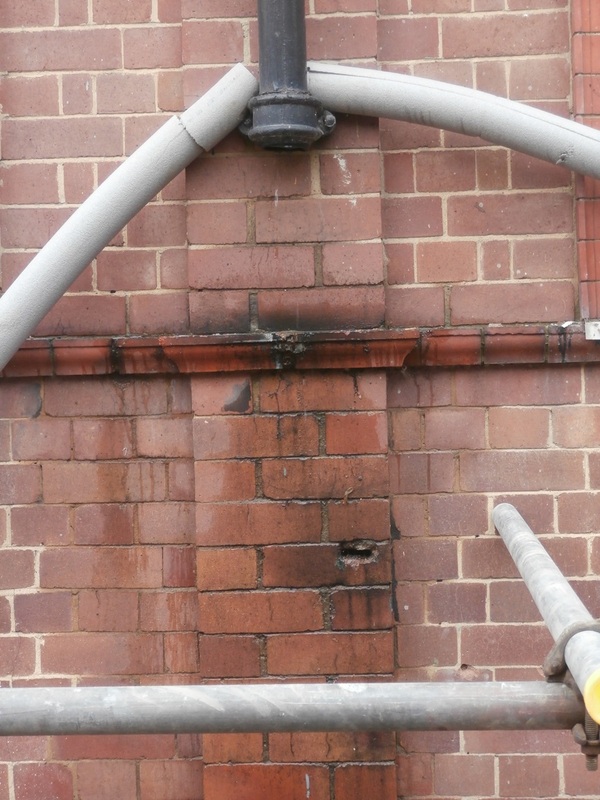 The consequence of this was a gradual reduction in outdoor space for the girls, of course – something the building’s first extenders had sought hard to avoid. We are now left with only a small inner courtyard. The picture also shows recent building work to the west of the Tankerville site. 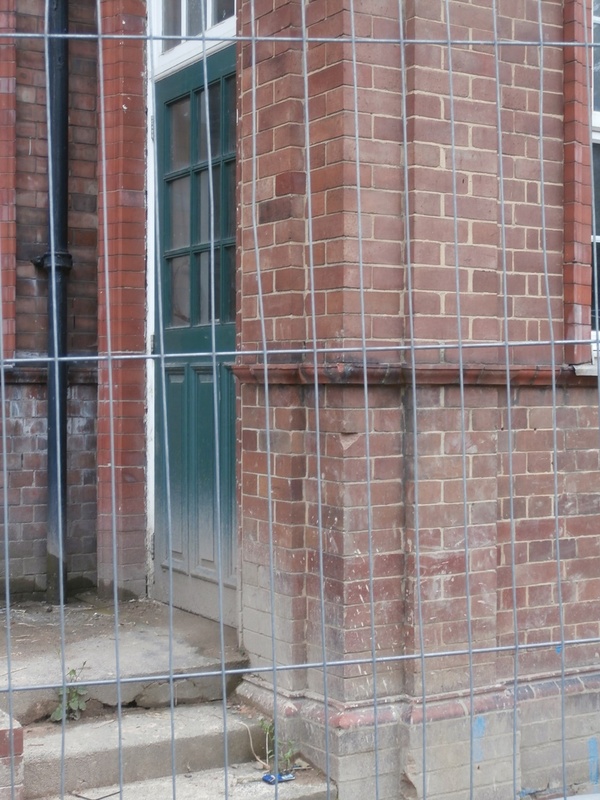 The Nuffield Unit and old tennis courts are now in the process of being transformed into a care home and nursery. The quadrangle and new McCardle Care Homes development to the west – our future neighbours – from the north gable. While he was up there, Paul clearly did virtually a 360 degree turn. The next two shots on my camera were of the roofline to the north-west of the north gable looking towards the copper-panelled new build. 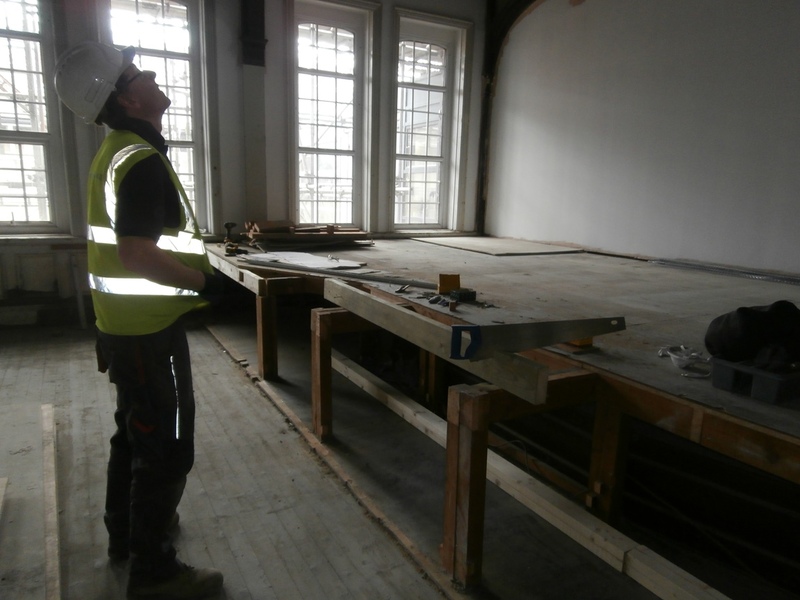 At that point in time, the 1925 Science Laboratory extension – initially built on stilts to retain playground space and most recently used as two Geography classrooms – was in the process of being re-tiled. 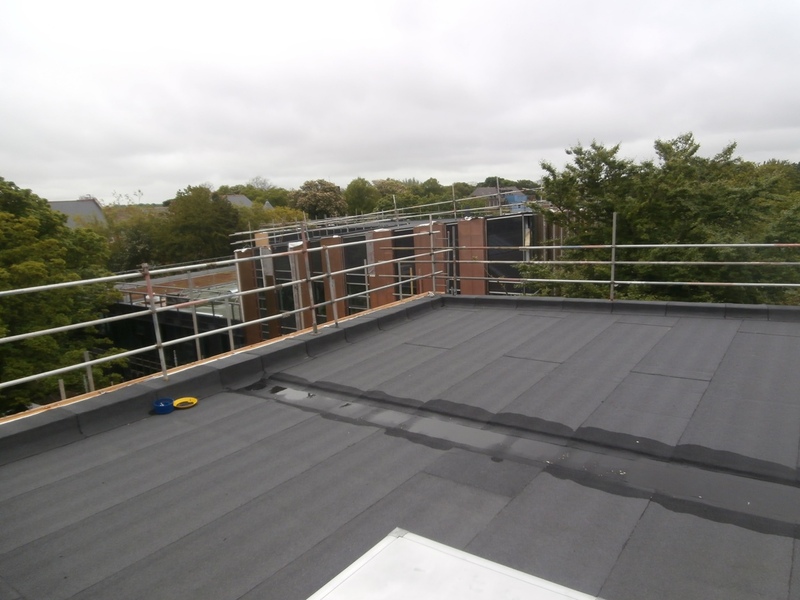 Another shot shows the flat roof of the new infill extension. 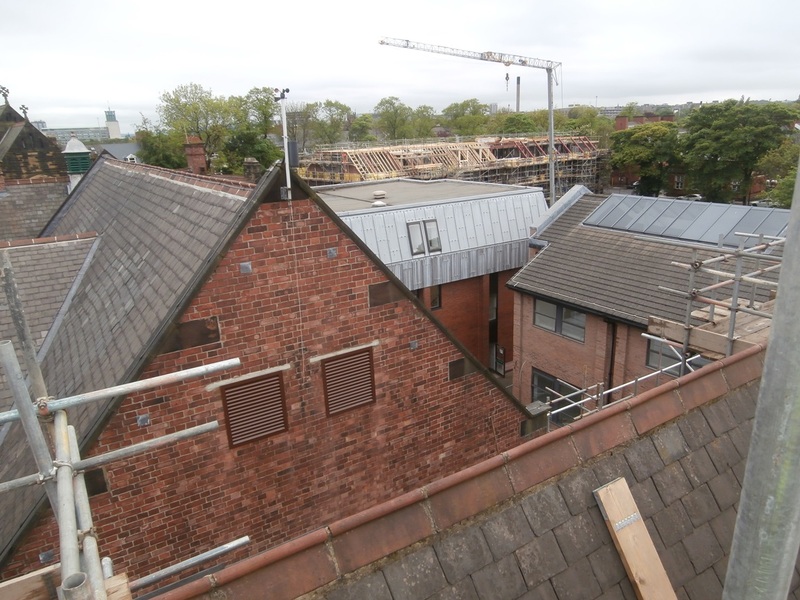 From the left: roof of the 1998 Art Block & 1925 Church High extension (above) and the newest infill extension (below). If I asked you how many chimney stacks were up there on the roof of the Main Building, would you know? It certainly wasn’t something I’d ever considered until Giuseppe photographed and documented them all as part of the roof repair process. Well, there are actually 12 of them up there! That day, Paul photographed two for me from the north gable. The first still has a Victorian terracotta pot in situ. 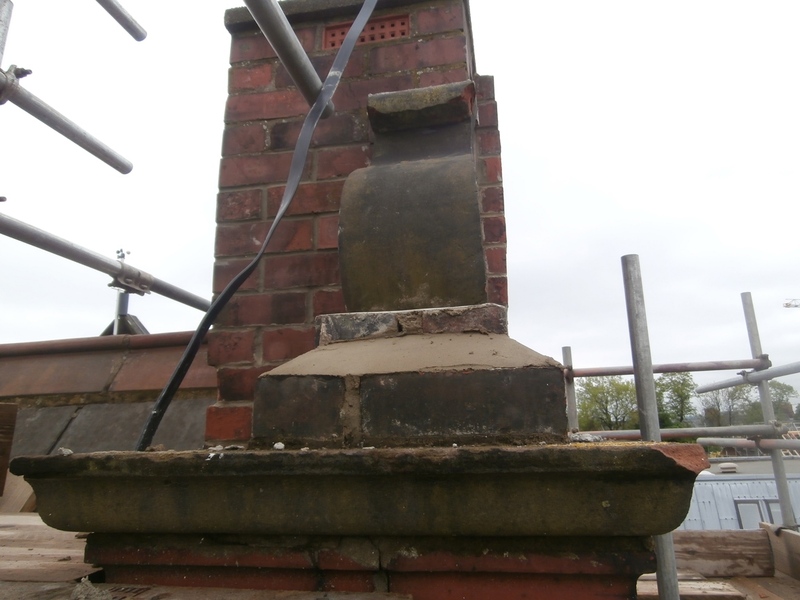 A large Victorian terracotta chimney pot on the east gable. 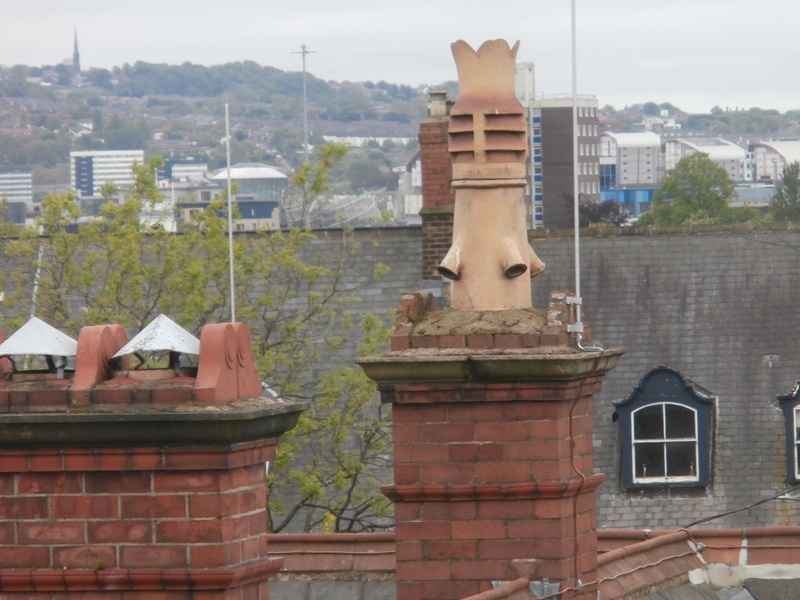 For me, it was the pot-less chimney stack Paul photographed which proved to be the most fascinating. From the ground, the architectural details on some of the stacks is not obvious at all. 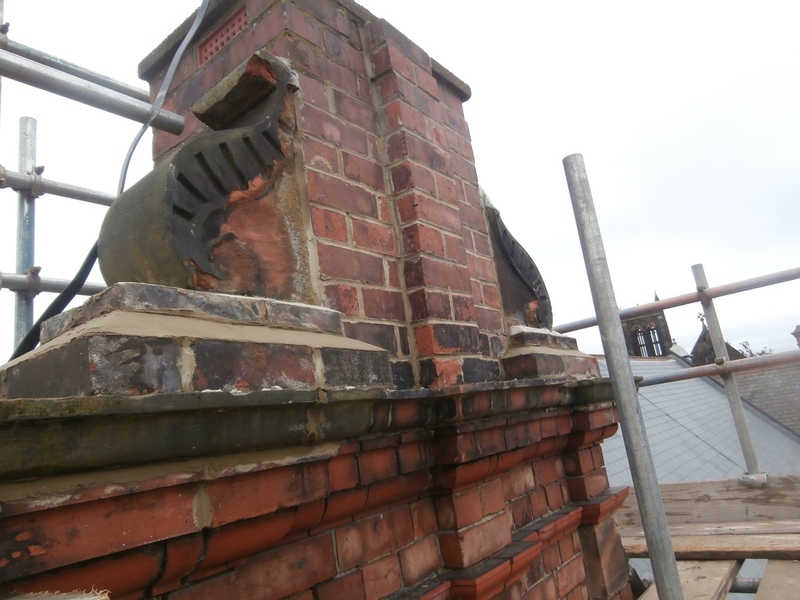 However, up close, the stacks on the original Newcastle High School building, such as this west-facing chimney on the end of the north gable, all feature stonework carved with intricate scrolling at their bases. Carved stonework on the west-facing north gable end stack. The obelisks, of course, are much more easy to see from the ground. Stone obelisk at the apex of the north gable eastern elevation. I’ve no doubt I shall refer to this book again the future, but the detail below from Plate 118 in Pierre Chabat’s book ‘Victorian Brick and Terra-cotta Architecture’ (1989) featuring the gables of 16th & 17th Century buildings in Amsterdam and Haarlem shows just how much Oliver & Leeson were influenced by Flemish architectural style. 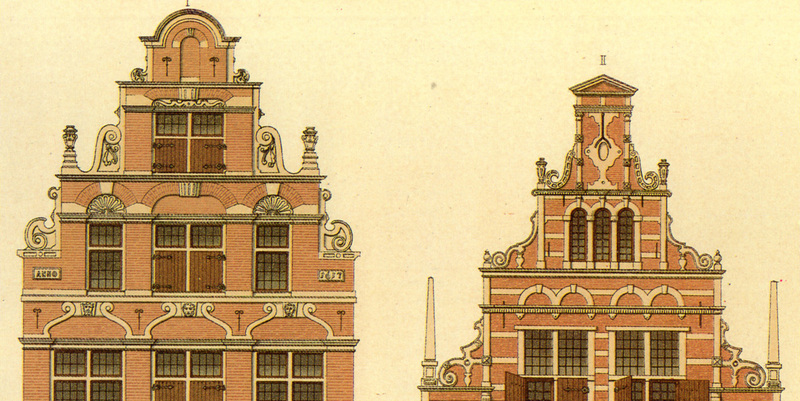 Obelisks & scrolled stonework in Amsterdam and Haarlem. As I will probably never get up there myself, I’m really grateful to Paul for the unique view of this beautiful old building he provided me with while I sat there waiting down below on my little wall. 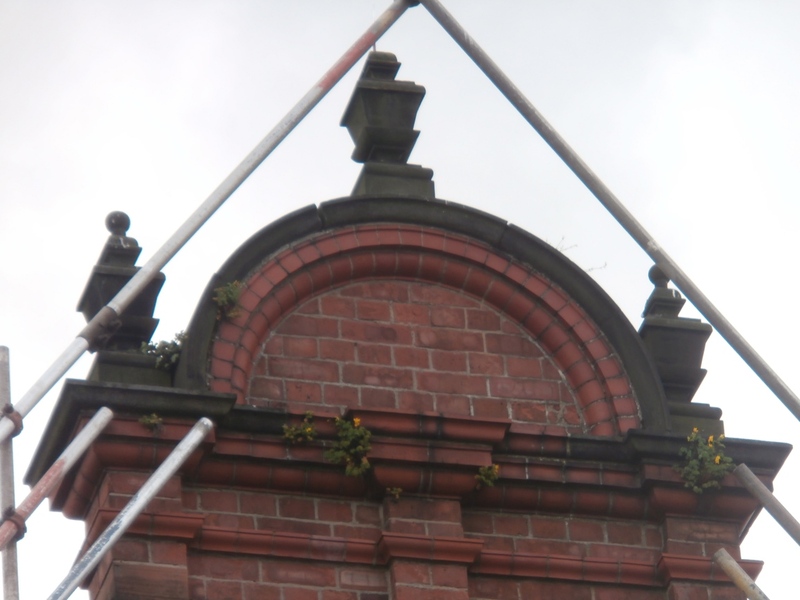 The abiding image I was left with, however, once everything had been assessed and absorbed, was that there have clearly been seahorses sitting high up on the roof of Newcastle High School since 1888. Is it just me, or have there clearly been seahorses high up on the roof of Newcastle High School from the very, very start?